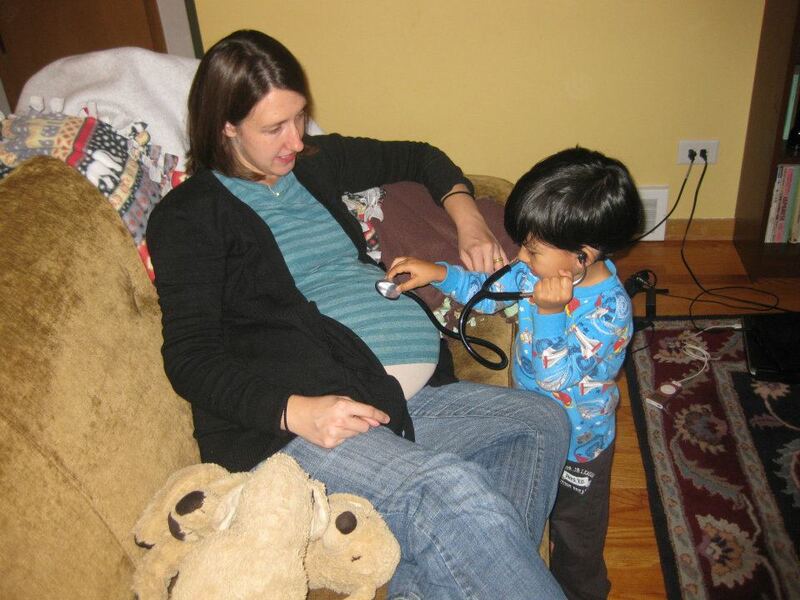 Kelly’s son trying to listen to the baby’s heartbeat during her last prenatal check-up. Most of her prenatal check-ups were at home. I’m Kelly, 30 years old. Mom to Ravi and Maya, wife to Shashi. I’m interested in women’s health issues and minored in women’s studies in college. Since the birth of my son three years ago, I have become passionate about breastfeeding and became a leader for La Leche League. I’m writing about the birth of my second child, Maya. My due date was October 17, 2011, and Maya was born October 17, 2011! I was shocked to have a baby born on her due date! What was Maya’s weight and length? 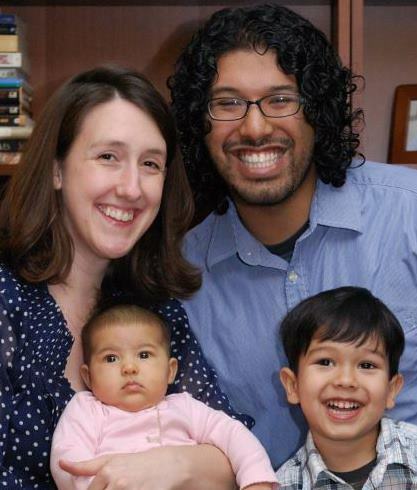 Maya Kumari weighed 7lbs 4oz and was 21 inches long at birth. Please give a brief synopsis of your birth. Looking back, I can see that I felt funny all day Sunday. My thoughts and feelings turned inward as my body prepared for labor. My husband cared for our son all day. I took a walk by myself. That night I began having regular “this is IT” contractions around 11:30pm. I couldn’t sleep, so I listened to Norah Jones music on my iPod. I rested in bed and tried to relax. A few hours later the contractions were feeling stronger, so I woke my husband. 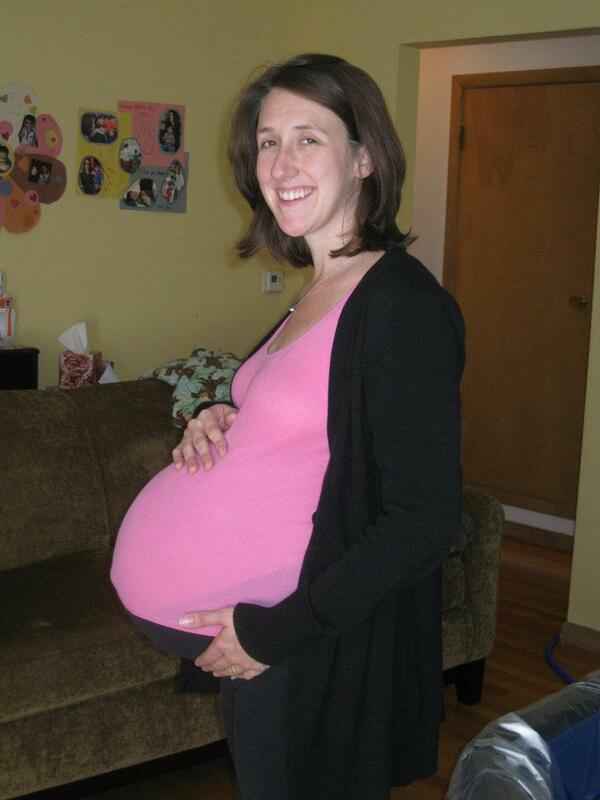 I was feeling nauseated and shaky before each contraction, so I called my midwife. The two midwives and the doula who were to attend my birth were all in attendance of another mother in labor! They asked if I needed someone to come to my house right then, and I said no and promised to keep them posted about my progress. My husband set up the birthing pool in our living room, but I didn’t get in because the midwife told me to wait until they arrived to do so. I continued listening to music and relaxing in bed most of the night. I ate wonderfully cold and sweet red grapes and drank lots of water. I walked around when I felt the urge. Around 6am I talked with the midwife and told her I was frustrated with my seeming lack of progress. I’d been in labor all night, and my contractions still weren’t coming regularly! She wisely advised me to rest and said my body would go into more intense labor when it was ready. So I tried to sleep. My three year-old son woke up around 7am, and my husband and I got up with him and tried to have a normal day. We ate breakfast, and I walked around the house a lot. I vocalized through the contractions, walked, rocked my hips, paced the house, had snacks, drank water and more water. The sun was shining and my son was running around the house playing his usual games. The normalcy was comforting. My husband called my parents (who live two hours away) and asked them to come so they could watch our son. I texted one of my friends and told her I was in labor and asked if she could watch my son if I needed her to. She asked if I wanted to bring him over now, and I said no – I thought I still had plenty of time! Suddenly, things started feeling more intense. My vocalizations through the contractions were getting louder and louder. I felt like I needed my doula! I called her twice and left her messages, but she didn’t pick up her phone! I decided to call the midwives, because I needed someone there (besides just my husband, who was taking care of our son). I spoke to one of the midwives, who said they’d only gotten back from the other mother’s birth an hour before and had been resting. Could I wait it out and give them a call back in another hour? I answered no! I needed someone there. The midwife said they would come right away. I was feeling like I couldn’t do it anymore, I didn’t know what to do during the contractions to ease the pain. Standing, sitting, nothing sounded good. Remembering something our doula had discussed with us, my husband suggested I try getting on my hands and knees. I agreed to try it and made my way to our bed before the next contraction. I got onto my hands and knees and the feeling was like nothing I’ve felt before – like tingling, electric shocks in my lower back! The pain was so intense I could only pant. I moaned, “That was a bad idea!” and sort of fell onto my side on the bed. Then my body took over and I started to push! I told my husband, “I’m pushing!” He called the midwives and told them to hurry up and then told me he would go read our son a book in his bedroom. I told him no way, I needed him there. He set our son up with a video in his bedroom with the door shut and ran back to me. I continued pushing, and my water broke with a burst. I was still fully dressed! My husband spoke with the midwives over the phone, and they talked him through getting the birth supplies ready. He ran from the window to the bed and back again, checking to see if they had arrived yet. Finally – they arrived! The midwives rushed into the house, helped get me undressed, and Maya Kumari was born three minutes later, at 11:23am on Monday, October 17, 2011. A few minutes later we all chuckled as my son called from the other room, “Hellooo? Anybody?! !” He’d watched a video through the whole delivery! Kelly during labor, an hour or two before Maya was born! She wanted to get in one last belly picture. I read Birthing From Within, which helped me confront some of my fears about the labor. I talked with our wonderful doula, who also helped give me confidence and allay some fears I had. I tried to eat a nutritious diet and get lots of exercise. I took a prenatal exercise class with lots of kegels! I think all of this helped to get me ready for Maya’s birth and contributed to labor going smoothly. I loved laboring at home, with just my family around me. I loved walking around my own home, eating and drinking at will. Just listening to my body and rolling with the labor instead of fighting against it. It would have been nice if the ending hadn’t been so hectic. Since my husband and I were alone, we were a bit frantic. 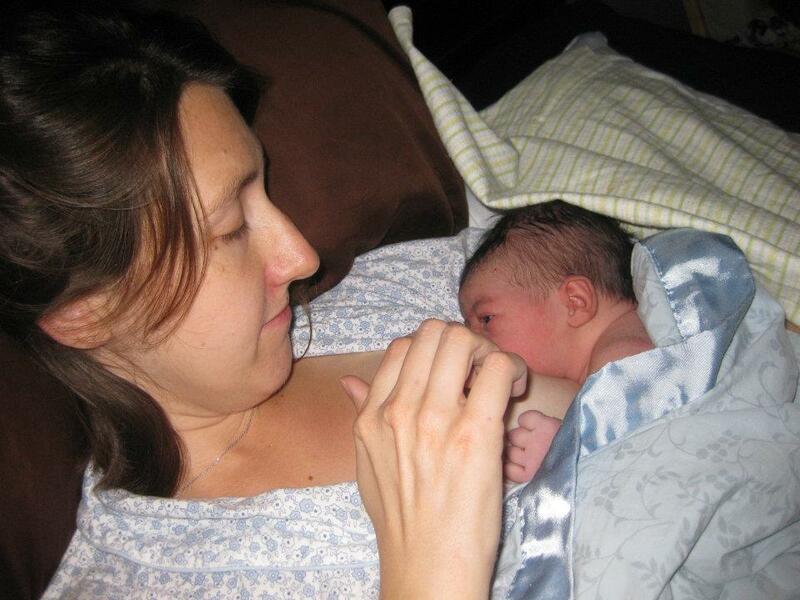 I remember thinking, “I wanted a homebirth, not an unassisted birth!” On the other hand, I think the labor probably went faster than it would have if we hadn’t been alone. I didn’t feel self-conscious at all and wasn’t holding back. I was surprised that my contractions never got into a regular pattern. I was waiting for that the whole time, thinking it needed to happen before the baby would be born. I was also surprised that my water didn’t break until I was pushing, since it had broken pretty early in my labor with my first child. I thought I would have to push for a long time, since I’d pushed for 3 1/2 hours when my son was born. This time it was about 10-15 minutes. 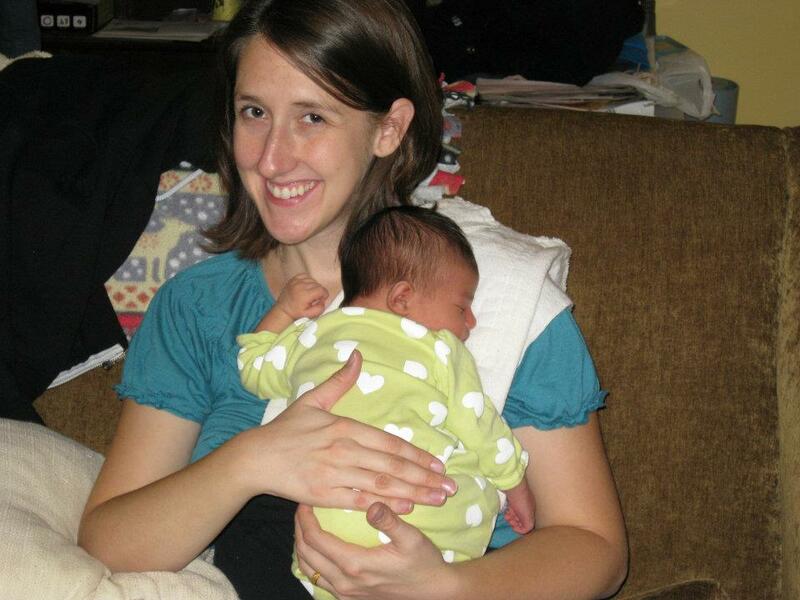 Kelly with her daughter Maya shortly after her birth -skin-to-skin and initiating nursing. I would have had my husband take our son to my friend’s house that morning, so he wouldn’t have been in the other room during the birth. (It would have been less stressful for my husband if he hadn’t needed to worry about our son while he was helping me in labor.) I would have asked the midwives to come earlier. The last few minutes, from the electric feeling I got in my lower back, to the sudden urge to push and pushing before the midwives arrived. After the birth, I remember being excited to find out if our baby was a boy or girl. I laid her on my chest and pried apart her legs and found out…it’s a GIRL! My husband and I were ecstatic and in disbelief. I’d thought the whole pregnancy I was having another boy. I thought I would have the midwives and doula at my house for hours before the birth. I thought I was going to use the birth pool, but it sat unused! In some ways it was easier than I thought it would be. The pain was very intense for the last 45 minutes, but was very manageable throughout. I was so happy and proud that I’d had Maya at home and with no interventions or medication at all. I felt so strong! I was also relieved that it was over and everything had gone well. My recovery was good! I was very gentle with myself and took the time that my body needed to heal. I had lots of help from friends and family. My mom stayed with us for 4 weeks to help care for all of us. I didn’t rush to get back to normal life. I felt surprisingly great and ecstatically happy. I felt like I was on some sort of happy drugs. How has your perspective of your birth experience with Maya changed in the last four months since the first week of having her? I guess I would say that I’ve probably forgotten some of the pain. I focus on the positive outcome of the labor and delivery and don’t think much about the pain that was involved. Looking back, it feels like no big deal, but I know that at the time it was intense. I learned that I am strong, and my body is a beautiful thing (and I’m not talking in appearances). Would you recommend having a natural childbirth to other women? I would absolutely recommend a natural childbirth to any woman who wants one and/or is able to have one. It’s such a beautiful thing when everything works as it’s supposed to and you can just sit back and let nature take its course. Laboring at home instead of in the hospital is fantastic! Recovering at home is also so much more comfortable than being in the hospital. Take care of yourself when pregnant and listen to your body. Relax, breathe. Take each minute as it comes. 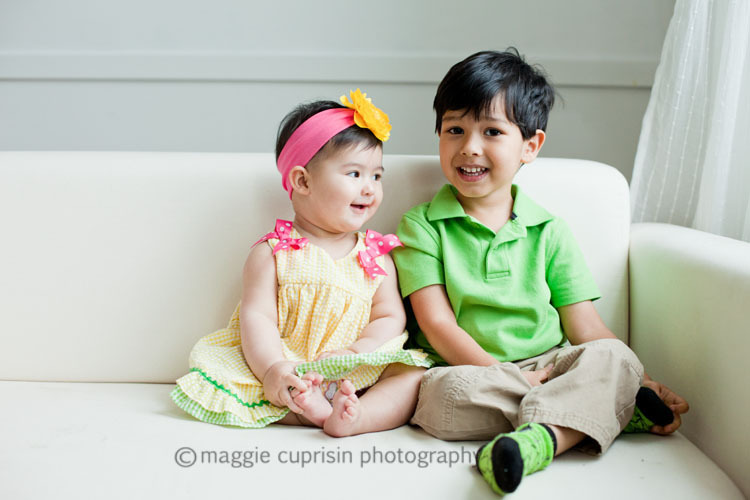 An adorable photo of Maya and her brother, Ravi. Great interview and what a cute family!! What a fabulous idea! Can’t wait to read all the stories! -Dylan Yates Labor and Delivery-R.N. Thanks for saying so and for stopping by!